The GOP was dead when Reagan left office in 1989. After Reagan got 2 terms, the GOP Establishment determined, "we ain't never gonna let THAT happen again!" And they haven't. ALL have been Establishment GOP (some worse than other, obviously), except Trump, who was a Democrat until 2-3 years ago, and he is really a populist with a nationalist streak. NONE have been Conservatives in the mold of Ronald Reagan. The GOP as a party has not stood for Conservative Principles since they took over Congress in 1995, for the first time in 40 years, and passed 7 of the 10 points of the "Contract With America." And after they did that, they let Bill Clinton take the credit, and bowed to him for the rest of his Presidency. They even allowed him to shut down the government and blame them. By 1996, I resigned by position as a County Executive Committeeman in the SC GOP and left the party. The Establishment is too entrenched. They fixed the system after Reagan so that Conservatives cannot get the nomination. Trump -- he was, and is, an anomaly, that they haven't figured out yet. Truthfully, were it not for open primaries in a number of States where Independents and Democrats could crossover and vote in the GOP primaries, I doubt Trump could have won the nomination. But it is absolutely certain a Conservative NEVER will again. The GOP Establishment want nothing more than to thwart Trump where he wishes to upset the Status Quo. No change to ObamaCare, Taxes, etc. They are as much a part of the system -- and the problem -- as Democrats are. In that much, Trump deserves the support of Conservatives -- although we may not support his specific "fixes" of those problems. We'll see. Bottom line: The GOP will have to die and a new 2nd Party will have to emerge to take it's place before the Status Quo can ever change. And so many millions are so entrenched in the current status quo that it may take civil war to rip them away from it.... That's what happened the last time a new party entered the system: The Republicans. "I voted no on #HR3003, No Sanctuary for Criminals Act. This bill increases the Department of Homeland Security's (DHS's) detention of suspected illegal aliens, defunds sanctuary cities, and limits the ability of state and local governments to direct their law enforcement resources. In doing so, the bill violates at least five constitutional amendments. The bill violates the Tenth Amendment by prohibiting any state or locality from doing anything that would restrict the ability of their law enforcement officers to "assist" federal immigration enforcement, giving state and local governments legal immunity for providing such assistance, and limiting transfers of aliens to sanctuary cities for criminal prosecution. I have voted in the past to defund law enforcement grants to sanctuary cities that prohibit information sharing between their law enforcement and federal immigration officials (including #HR3009 in the 114th Congress), but this bill also prohibits any actions or policies that may restrict local law enforcement's cooperation with, or assistance to, federal immigration enforcement. This goes far beyond just facilitating the exchange of information that local law enforcement may already come across in the course of their own activities; this bill unconstitutionally enables the federal government to coerce states into helping with actual enforcement of immigration laws. Plus, it gives immunity to states for assisting with immigration enforcement, and it affirmatively punishes states for noncompliance. Congress has no authority to direct state and local officials in this way. Our Constitution establishes a system of dual federalism. In Congress, the laws we make are to be executed by federal officials; we may not commandeer nonfederal officials. The bill violates the Fourth Amendment's prohibition on unreasonable seizures and the Fifth Amendment's due process requirements by increasing DHS's use of, and authority for, warrantless arrests and detentions of suspected illegal aliens. As their texts make clear, the Fourth and Fifth Amendments apply explicitly to all "people" and "person[s]" within the United States. The Constitution uses the word "citizen" in other provisions whenever that word is intended. This interpretation of the Constitution's applicability is shared by the Supreme Court, including among the conservative justices. The bill violates the Eleventh Amendment—which largely prohibits Congress from unilaterally permitting lawsuits against states—by allowing the victims of crimes committed by an illegal alien to sue a state that declines to fulfill a request from the federal government to detain the alien. Lastly, the bill violates the First Amendment by likely interfering with the ability of state and local officials and other individuals to make statements regarding immigration enforcement policies and priorities. I support securing the borders, and I have voted to defund sanctuary cities, but I swore an oath to support and defend the Constitution, even when it means I must oppose bills aimed at policy goals that I support. You should know better. The Tenth Amendment is clear, that "The powers not designated to the United States by the Constitution, nor prohibited by it to the States, are reserved to the States respectively, or to the People." But, the authority to make laws with regard to immigration (or naturalization) IS among the enumerated powers TO the Congress of the United States in Article I, Section 8 of the Constitution. “The two references in the Constitution that specifically mention “naturalization, ” are found in Article I, Section 8 in creating the authority of the Congress, “To establish an uniform Rule of Naturalization.” Thus from a Constitutional stand point it is the responsibility of Congress to establish all laws and rules of naturalization or immigration. So, Rep. Amash, here, You MISapply these 5 Amendments to illegal immigrants, and, in THIS case infer to the States powers they do not have, Constitutionally. In the United States, the "Higher Power" or "Government Authority" of Romans 13:1-7 is the Constitution. The Constitution is "Caesar." As Founding Father John Adams observed, "We are a government of Laws, and not of men." However, it is and always has been incumbent upon "We the People" to KEEP our government a Constitutional Republic, as intended by the Founders. Benjamin Franklin rightly warned the people of the nation that in the Constitution, the Founders had given us "A Republic, if you can keep it!" Additionally, John Adams further warned Americans that "Our Constitution was made only for a moral and religious people. It is wholly inadequate to the government of any other." So, why are we in the mess we're in today? Because it was, and is, up to Americans, to "...bind him [the government/government officials] down from mischief by the chains of the Constitution..." as Thomas Jefferson exhorted us. We have, as a people, FAILED to do this. We have failed because we have, over generations, had neither the moral fortitude nor the political convictions to enforce these ideals our Founding Fathers bequeathed to us on a government full of men with designs on power, graft, and the distortion or destruction of our Constitution and the very republican order upon which we were founded. Based on these standards, they have "won." That does not mean I, as an American nor as a Christian, am not still entitled to the "inalienable rights" given me and all men by their Creator, nor that I am exempt from standing up and fighting for them, against tyrants and despots -- even if they are my "countrymen." Constitutional Conservatives will disagree to some degree with Libertarians in regard to where ones Liberty ends, and the infringement on another's begins, and also what must necessarily constitute a just and orderly society. But, with few -- in fact, I can only think of ONE -- exception, Constitutional Conservatives believe these issues belong at the State level, or even the local level, not at the Federal Level -- except where they might compromise certain Federal duties or assigns (National Defense, interstate commerce, etc). IN general, Constitutional Conservatives certainly affirm that self-government is the best government. And Constitutional Conservatives are better characterized as believing in an ASSERTIVE foreign and military policy, as opposed to an "aggressive" policy. The difference would be that, as a Constitutional Conservative, I did NOT agree with Obama's military campaign in Libya (in fact, it was illegal, if one considers the War Powers Act of 1973 to carry any weight). However, Establishment Republicans (and some, referred to as "Neo-Conservatives", though they are neither new nor "conservative") like Sen. John McCain and Sen. Lindsey Graham were all for Libya -- and any other engagement they can entangle us in. An "assertive" policy recognizes OUR global interests, our presence around the world, and the global threat environment which now exists. An "assertive" policy would not allow us to practice "isolation" from the global scene -- but it would also guard against involving us in every single conflict in the world, especially those in which we have no vested interests, and our citizens are not in harms way. An "assertive" policy would maintain our "presence" at strategically important points and places in the world -- but it would also insist that we divest ourselves of hundreds of out-of-date military bases from long past wars where we no longer need to station our forces. An "assertive" policy would insist that our allies who can defend themselves, but have allowed us to defend them for decades, start paying for our services, and begin the process of building their own defenses, so that we can spend less time and money doing it for them. No -- I'm not a candidate. :-) But I have thought out the differences of a Constitutional Conservative from both "Establishment Republicans" and so-called "Neo-Conservatives," and also from Libertarians as well. Reasonable Libertarians and Reasonable Constitutional Conservatives can work with each other -- if they determine to do so. It's a heck of a lot easier than trying to work with Progressives OR Establishment GOP-types. And preferable too. These are not "atheists." 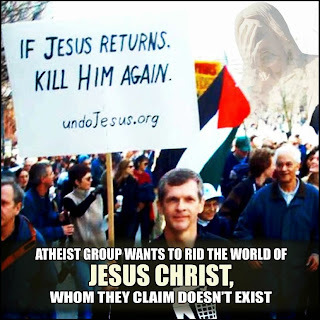 These are ANTI-theists. Atheists don't care if people believe in a non-existent "God." Anti-Theists HATE "God," or any concept of "God," even when they claim that "God" does not exist. Atheists are not bothered one way or the other by the religious beliefs of others, or lack of such beliefs. Anti-Theists HATE any such beliefs and take exception to them, are angered by them, belittle them, persecute them, and react violently to them. ....The rest were killed with the sword coming out of the mouth of the rider on the horse, and all the scavenger birds gorged themselves on their flesh." (Revelation 19:11-13; 15-16; 21). 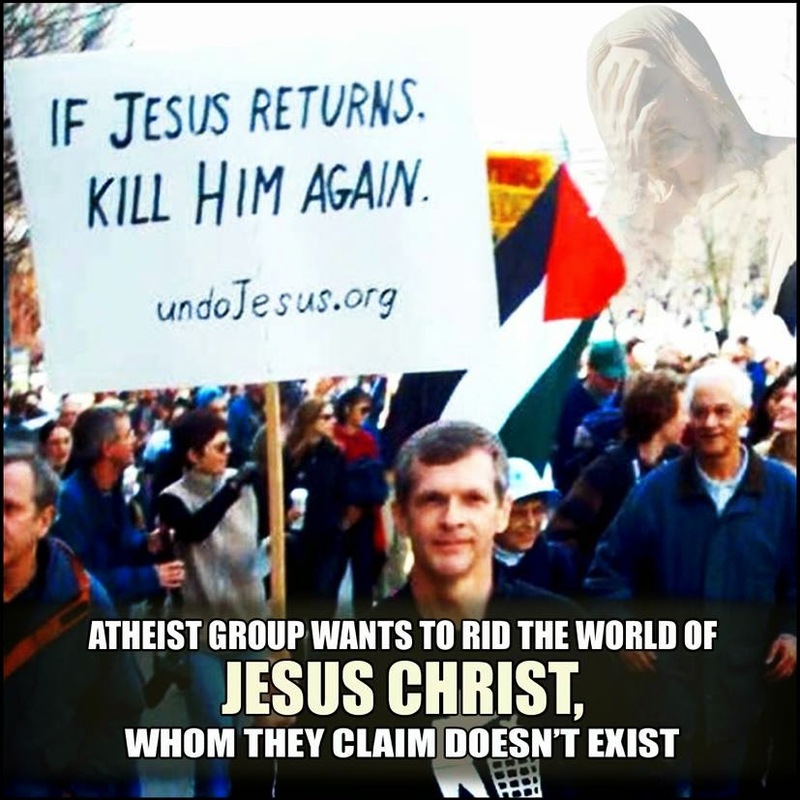 No -- they won't "kill Jesus again." Jesus said, "I am he that liveth, and was dead; and, behold, I am alive for evermore, Amen; and have the keys of hell and of death." (Revelation 1:18). NOTE: In 2012, as a part of my study of issues and movements in American History, I researched the origins of the Progressive Movement in the United States in the 1800's as a political philosophy and Social Campaign. The Progressive Movement was a combination of radical causes and reactions created by disparate elements on the political scene of the time. Chief among them were the alienation of labor due to industrialization, the isolation and persecution of immigrants to the US, the crisis in agricultural production of the time and the movement to protect the interests of rural farm families ["Populism"], urbanization, new political ideologies infiltrating the American 'body politic' - particularly the writings of Karl Marx and the early "Communists," and perhaps most surprisingly, religious revivalism that resulted in moralistic crusades against slavery, alcoholic beverages (the temperance movement), and a host of other "moral ills" and ethical challenges of the time. Those that bought into the "Progressive Movement" were often former violent revolutionaries who decided that it was more expedient -- and safer -- to seek "reform" via the ballot box and the "transformation" of the system from within than by revolution by violent means, such as force-or-arms. The paper below concentrates most on the origins of American Progressivism, and the role the particular eschatological (view of the future) known as "Postmilliennialism" plays in it's formation. A simple definition of post-millennialism is the believe that the Church, redeemed humanity, will positively change the circumstances on earth, and eventually bring in the kingdom of God through Evangelism and Political advancement, so that the Church one day will rule over the earth for a Utopian era, euphemistically referred to as "the Kingdom Age," or "the Millennium." It is only at the END of this time that Christ Returns to receive His kingdom. This view is very optimistic about the ability of humans to achieve success and triumph over evil via human institutions, including the Church, the State, and even corporations and unions. Postmillennialism was the "majority" view of most of Christianity, particularly those influenced by Calvinists/Puritans in New England, the Mid-Atlantic, and the Mid-West, and spreading to the Southward in the later 1800's. No political movement has impacted the United States over the past century more than Progressivism. The principles, policies and values of Progressive ideology are integrated into the fabric of the American nation at every level of governance and society, and its views and beliefs are ingrained in the hearts and minds of many in every class across every region of the country. At one time, however, Progressivism was not natural or accepted ideology, but a new and foreign concept that was rejected by many Americans, or at least unknown and vaguely defined. The question that confronts the historian is, how did the philosophy of Progressivism, which would give rise to so much of the modern and postmodern socio-political landscape, become the most effective, impacting and powerful American political movement of the last 100 years? The Progressive Movement certainly doesn’t owe its whole existence to American sources and personalities. With the emergence of the socio-economic political theories of Karl Marx, “socialism” or “communism” became quite popular after the publication of The Communist Manifesto in 1848, and the philosophical premises of Marx’ ideology were to some extent adopted by those in American Government and politics, which contributed greatly to the continuing hunger of many for the centralization of power in a Federal State, a centerpiece of the Progressive Movement. Many members of the early Marxist movement from Germany and France immigrated to the United States after the failed Marxist French Revolution of 1848, and became leading proponents of the Union Cause in the American Civil War, supporting Lincoln, the strengthening of the Federal Government, and centralized political power. Karl Marx himself, as well as Friedrich Engels saw the victory of the Union as a triumph for Socialism, and Marx even penned a letter of support to Lincoln during the course of the war. These early infusions of foreign “socialist” intellectual encouragement in addition to the many thousands of Europeans that immigrated, bringing their dialectical materialist worldview with them certainly had an impact in creating the foundations of the Progressive Movement. and not of the same “class” as their predecessors in protest, the Populists, he contended they came from the same general line of ideological remonstrance against the system. While Populist rural farm and ranch laborers protested against the Cattle Barons and Railroads, Progressivist urban industrial laborers took up the cause against so-called “Robber Barons” or Captains of Industry. Socio-Economic and Political forces did not exhaust the attitudes and convictions that were driving formation of Progressivism, either. The United States was a nation given to religion, and particularly to a predominantly Protestant brand of Christianity that had its roots sunk deep into the traditional faiths of their European forefathers, particularly as they emerged from the Reformation era of the sixteenth and seventeenth centuries. While many Americans came from spiritual backgrounds steeped in one of the English Church traditions or its “spin-off’s,” the Anglicans, Episcopals, Baptists, Methodists, Congregationalist Puritans, and so forth, many others followed similar Protestant Church traditions, though with their own national and cultural flavors, such as the German Lutherans, Dutch Reformed, Scottish Presbyterian, French Huguenot, Moravians, Waldensians, and so on. Regardless of the particular strain of Christianity, however, Historian Nathan O. Hatch observed two very important “central components” that were common to most Christians of the Early Republic, and that by their nature would come to mesh well with a Progressive agenda and political ideology, at least on the surface. First, Hatch noted that Christianity in America, unlike its European counterparts, had largely jettisoned the antiquated idea of the strict distinction between clergy and laity, and had instead adopted as the “central force” of the American faith “its democracy or populist orientation.” Hatch went on to explain that this “empowered ordinary people by taking their deepest spiritual influences at face value” rather than subjecting them to “the frowns of respectable clergy,” and actually freed the lay people to act on their faith, their belief system, and to become involved. These two elements of personal empowerment and populist orientation were big influences on the psyche of common Christians in the first half of the nineteenth century, which explains why a growing number of them became involved, not only in spiritual matters such as the “Second Great Awakening,” but also in social issues of the day like abolition of slavery, temperance and the fight against alcoholic beverages, women’s suffrage, the labor movement, and many more. But, what motivated the involvement of these Christians? What internal conviction, what doctrinal affirmation compelled them to labor toward the ends of establishing positive social change? Of particular interest in addressing this question, particularly during this period of American History, is the way Christians saw the future. Eschatology is “a branch of theology concerned with the final events in the history of the world or of humankind; a belief concerning death, the end of the world, or the ultimate destiny of humankind; specifically : any of various Christian doctrines concerning the Second Coming, the resurrection of the dead, or the Last Judgment.” Most American Christians have always considered their understanding of how the future will unfold from both a Biblical and a social perspective to be an essential facet of their religious faith. From the earliest days of the nation, and in fact, back to the beginning of the Colonial period, many of the prominent Protestant ministers and theologians, heavily influenced by the Reformation tradition and Puritan experiences in the New World, took a very optimistic view of the future, believing that redeemed humans, as embodied in the Christian Church, would eventually evangelize and win the world to Christ, leading not only to a spiritual but also to a social transformation of the entire globe; a Kingdom of God come on earth. The question, then, is how this popular, fervent and optimistic brand of Christian Eschatology became an influential, perhaps even formative element in the development of the political movement called Progressivism in the late nineteenth century United States. societal reform in order to usher in the millennial reign of Jesus Christ. belief and right behavior are two sides of the same spiritual coin. Mark Noll and Luke Harlow additionally observed that, though most of the “Yankee Pietists” were from the “anti-liturgical” traditions (such as “Baptists, Methodists, Disciples, Congregationists, Quakers”), in the political and social movements, the term was “too vague,” and “confessionalists can be pietists and devotionalists too.” The social and political implications of “Yankee Pietism” transcended the sectarian Christian doctrinal differences. This ecumenism naturally lent itself to “other than Christian” motivations for accomplishing goals for the greater good, and later perhaps motivations with no religious foundation at all. Numerous historians have addressed the effect of the Christian eschatological belief system of Postmillennialism and how it influenced the development of the United States politically, particularly during the nineteenth and early twentieth century. Daniel Walker Howe noted that “Postmillennialism provided the capstone to an intellectual structure integrating political liberalism and economic development with Protestant Christianity.” This was certainly not the universal view of all Protestant Christians of the time, but with the champions of Second Great Awakening like Lyman Beecher, Richard T. Ely and Charles Grandison Finney, it became the prevailing view by mid-century, and certainly after the Civil War. Part and parcel of postmillennial eschatology was the encouragement of activism. It was this brand of Christian eschatology that drove the “continuing moral and social improvement” movements such as abolition, temperance and women’s suffrage, and also “provided the rationale and motivation to sustain the imperial vision” along the way, leading to such events as the Monroe Doctrine, Manifest Destiny, the Spanish-American War and ultimately World War I. According to Mark Noll and Luke Harlow, there is no doubt that as Postmillennial “Yankee Pietism” grew in numbers and social clout, beginning early in the nineteenth century when they “launched a crusade to Christianize America.” This agenda was deliberate and divided into two phases. from four to fourteen years. In the absence of a strong reliance on Christian traditions and staunchly held cardinal doctrines, those who maintained a generally “postmillennial” eschatology began to gravitate to a philosophy that placed their reliance in another means of “establishing the kingdom.” "God,” Richard T. Ely declared, "works through the State in carrying out His purposes more universally than through any other institution." This was the perfect soil into which was sewn the seed of collectivism, Darwinian Evolution, a drive by Radical Republicans during and following the Civil War toward centralization of power in the Federal Government, and a Marxian Dialectical Materialistic philosophy that conspired to produce Progressive political pioneers like Robert M. La Follette, and Presidents Theodore Roosevelt and Woodrow Wilson. The emergence of politicians like Wisconsin Governor and later Senator Robert M “Fighting Bob” La Follette in the last half of the nineteenth century tracked with the merging of the social practices and political ideas of the more liberalized Postmillennial Pietists and their more secular and materialist counterparts in public life. La Follette, born in 1855, rose to prominence as a Congressman first elected in 1884 and serving three terms as a champion of the populist interests of common laborers and farmers, and an outspoken foe of the industrial giants and corporate interests like railroads and the lumber industry, very prominent in Wisconsin. La Follette himself had been raised by a Baptist mother who had come west with Yankee Pietist ideals already formulated, however his father Josiah La Follette, who had died when Robert was young, was an agnostic. When his Mother remarried John Z. Saxton, a very conservative, strict and dedicated Baptist, Robert grew to dislike the formal religion and doctrinal absolutes of his Step-father. “I got fed up with that sort of thing as a boy. My stepfather insisted on entertaining the Baptist Minister every Sunday,” La Follette once quipped when asked about his disposition to churches and religion. According to biographer Nancy Unger, his disdain went further than merely disliking the institution, but the harsh discipline his religious Stepfather often inflicted upon he and his siblings for “poor manners, impoliteness, and discourtesy” and other unacceptable behaviors in children of the day. Yet La Follette never abandoned the ideals of “Yankee Pietism” he was taught as a child, and he wove them into his social philosophy and political ideology, forming a microcosm and prototype of the exemplary “Progressive” in the late nineteenth century, having moved away from the overt religious faith, but kept the social involvement and activism, and gravitated toward a much more statist and collectivist theory of governance. In this sense, Robert La Follette serves as the nearly perfect reflection of what happened to the population of Postmillennial Yankee Pietists in the late nineteenth and early twentieth centuries. President Roosevelt knew how to make his view of an “energetic national government” palatable to the American people, however. As an example, this was demonstrated when he chose to run for re-election in 1912 after a term out of office. The Republican Party failed to nominate him, instead re-nominating incumbent President William Howard Taft. Taft was from the Conservative wing of the Party, and Roosevelt bolted, running on the “Bull-Moose” ticket – another name for the Progressive Party. At the conclusion of the Progressive Party convention that year, Roosevelt is reported to have proclaimed, “Our cause is based on the eternal principles of righteousness; We stand at Armageddon, we battle for the Lord.” As a response to his speech, Roosevelt had the Convention delegation wave their Bibles and march out of the auditorium as they sang the Christian hymn Onward, Christian Soldiers. Woodrow Wilson was, by far, the most successful President of the classic Progressive Era. Wilson managed to integrate the formerly separate Progressive Party into his Democrat Party, and persuade his party to adopt many of their ideas. Among his greatest triumphs were the creation of the Federal Reserve Bank, the passage of the Sixteenth Amendment approving the “graduated” or “Progressive” Income Tax, the Seventeenth Amendment authorizing the direct election of Senators by democratic vote rather than by vote of the State Legislatures, the creation of the Federal Trade Commission and the passage of the Clayton Anti-Trust Act regulating commerce and limiting monopolies as well as aiding organized labor, the Keating-Owen Act outlawing child labor, the Federal Highway Act, and the Eighteenth Amendment prohibiting the transport and sale of intoxicating liquors. Raised the son of a Presbyterian Pastor and Theologian, he drank deeply from the well of Calvinist theology, believing in the tenets common to the Reformed tradition: Predestination, the omnipotence and sovereignty of God, and a personal life of devotion to his faith which included daily Bible reading, morning and evening prayers, and church attendance, including at mid-week prayer services. If Robert La Follette was the prototype of Progressivism’s beginning, it’s flirtation with Christian themes but adoption of secular and materialistic methods and goals, then President Woodrow Wilson was the personification of the Postmillennial Progressive Christian. His religious convictions and ideas of God formed the framework of his entire worldview. His assurance in the truth of God’s sovereignty and predestination gave him a confidence in God’s guidance, both for himself as a leader, and for the nation he led. He held an optimistic and idealistic view that the United States, as a Christian nation, was to exemplify that devotion to the elements of righteousness which are derived from the revelations of Holy Scripture.” Wilson was firmly postmillennial, viewed his role as a messenger of God, and considered his support for democracy, the “War to End All Wars” (World War I) and establish a “League of Nations” as “divinely inspired paths” to achieving the prophesied “Kingdom of God” spoken of by the prophets in Scripture. The eschatological view of Postmillennialism found its greatest acceptance among Protestant Christians in the United States, Europe and around the industrialized world as Christian missionaries continued to reach new lands with the Gospel, revivalism and awakenings continued to flourish, and Christian nations enjoyed general prosperity and comfort. Is it any coincidence that during this period of time, the political movement known as Progressivism developed, and enjoyed its greatest popularity during the Industrial Revolution in America and England when people saw their world improving, their faith growing, and their causes advancing? Of course, it couldn’t last forever. Woodrow Wilson’s second term ended after he’d won “The Great War,” but the American People balked at his “League of Nations,” fearful of the international entanglements it could bring. Wilson was struck down by a stroke, and the US economy suffered a brief but sharp recession as he left office, returning a Conservative, Calvin Coolidge to the Presidency. So, too, the days of Postmillennialism’s popularity were numbered. After 1921, the United States suffered two more major blows that caused many Christians to entirely abandon the optimistic eschatological prognostications once held by so many in the prior century. The Great Depression, which began in 1929 with the crash of the Stock Market, followed by a second and even more devastating World War less than three decades after the first simply crush whatever optimism many had left for a better world. Progressivism, however, has remained one of the most pervasive and longest lasting political movements in American history. The proponents of Progressivism and its reforms may find it politically expedient to change the labels they are wearing at a given time in the life of the national body politic, like “Liberal,” for instance, or they might retreat on certain policy issues when the political tone and atmosphere turns against them. A great example of that might be the Clinton triangulation on the issue of “Workfare” rather than “welfare,” which President Clinton initially resisted, but once a Republican Congress was elected, he not only embraced, but claimed credit for. This kind of tactical retreat and incrementalism has allowed the survival of Progressivism as political movement far longer than most others, and for that reason, its impact cannot be overestimated. Often, however, one of its most important sources is glossed over or completely missed by some historians and modern commentators. Much of the basis for the optimism, collectivism, and the positive belief in building a better world “progressively” may be attributed to the ascendancy of the nineteenth century Protestant eschatological view known as postmillennialism. Affirming a great optimism in the abilities of “redeemed humanity,” they believed the Church could bring about the Kingdom of God on earth through reform, economic and social improvement, and the use of Government to implement these changes, both in the United States and eventually, abroad. Though the initial dedication of early Protestant adherence to traditional doctrines gave way to higher criticism and their rejection, these more liberalized Christians retained their optimism, collectivism, concepts of Statist centralization and high opinion of human abilities to achieve a “utopian” ideal, and the result by the beginning of the twentieth century was a full and complete political philosophy known as “Progressivism.” This movement gave birth to modern Liberalism, and indeed, remains a major player in politics today as expressed in the ideology and policies of President Barack Obama, the Democrat Party, major Unions, Occupation Wall Street and the like. While it may seem unlikely in some cases, one of the pillars of Progressivism was a Christian Eschatological view with a positive view of the future, and of human’s abilities to bring it to pass. That vision endures in most Progressives of today. DiLorenzo, Thomas. Hamilton’s Curse. New York: Crown Forum Publishing Group, 2008. Edwards, Johnathan, Henry Rogers, Sereno Edwards Dwight. The Works of Johnathan Edwards A.M. Vol. 2 London: Childs & Sons, 1839. Evans, Christopher H. The Social Gospel Today. Louisville, Kentucky: Westminster John Knox Press, 2001. Fine, Sidney. Laissez Faire Thought and the General-Welfare State: A Study of Conflict in American Thought, 1865-1901. Ann Arbor: University of Michigan Press, 1956. Gillon, Steven M. & Cathy D. Matson. The American Experiment: A History of the United States. Boston: Houghton-Mifflin, 2006. Handy, Robert T. A Christian America: Protestant Hopes and Historical Realities.2nd ed. New York: Oxford University Press USA, 1971, 1984. Hatch, Nathan O. The Democratization of American Christianity. Boston: Yale University Press, 1989. Hutchison, William R. The Modernist Impulse in American Protestantism. Durham, North Carolina: Duke University Press, 1992. Kleppner, Paul. The Third Electoral System, 1835-1892: Parties, Voters, and Political Cultures. Chapel Hill: University of North Carolina Press, 1979. Link, Arthur S. ed. The Papers of Woodrow Wilson, Volume 23. Princeton, New Jersey: Princeton University Press, 1977. Magee, Malcolm D. What the World Should Be: Woodrow Wilson and the Crafting of a Faith- Based Foreign Policy. Waco, Texas: Baylor University Press, 2008. Moorhead, James H. "The Erosion of Postmillennialism in American Religious Thought, 1865 — 1925," Church History 53 (March 1984): 61 — 77. Moorhead, James H. World Without End: Mainstream American Protestant Visions of the Last Things 1880-1925. Bloomington, Indiana: Indiana University Press, 2006. Noll, Mark A., Luke E. Harlow. Religion and American Politics: From the Colonial Period to the Present. New York: Oxford University Press USA, 2007. Nye, Russell B. Midwestern Progressive Politics: A History of its Origins and Development 1870-1950. East Lansing, Michigan: Michigan State College Press, 1951. Pestritto, Ronald J. & William J. Atto, eds. American Progressivism: A Reader. Lanham, Maryland: Lexington Books, 2008. Quandt, Jean B., "Religion and Social Thought: The Secularizing of Postmillennialism," American Quarterly 25 (October 1973): 390 — 409. Schweikart, Larry & Michael Allen. A Patriot’s History of the United States. New York: Penguin Group, 2004. Unger, Nancy. Fighting Bob La Follette: The Righteous Reformer. Chapel Hill: University Of North Carolina Press, 2000. DiLorenzo, Thomas. Hamilton’s Curse. (New York: Crown Forum Publishing Group, 2008), pp. 16-17. Link, Arthur S. ed. The Papers of Woodrow Wilson (Princeton, New Jersey: Princeton University Press, 1977): Vol. 23, p. 20. “The Bible and Progress,” a speech delivered May 7, 1911, in Denver, Colorado. J. Dale Weaver, M.Div., M.A. I am 52, and a native North Carolinian who has adopted South Carolina as home. I became a Christian at age 15,and attended College at Wingate University. I have been in ministry for 30 years, and attended Seminary at Columbia International University. For the past 19 years, I have been a College Professor, and have served 4 schools as an instructor of Bible, Theology, Ministry, Religion, Church History, Western Civilization and American History. During my years in ministry, I have served as Pastor to three Churches in three States, in addition to serving on the staff of three other Churches.